On July 16, 1969, Neil Armstrong, Buzz Aldrin and Michael Collins were launched from Cape Kennedy atop a Saturn V rocket. This command module, no. 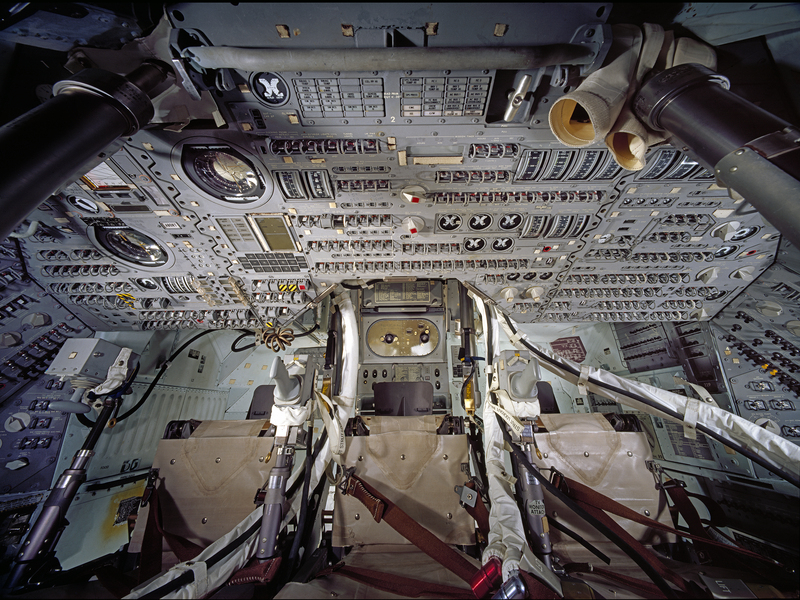 107, manufactured by North American Rockwell, was one of three parts (the command module, the service module and the lunar module) of the complete Apollo spacecraft. The Apollo 11 command module Columbia served as the living quarters for the three-person crew during most of the first manned lunar-landing mission in July 1969. Collins remained in Columbia, orbiting the moon while Armstrong and Aldrin landed on the lunar surface in the lunar module Eagle. Following their historic sojourn at Tranquility Base, Armstrong and Aldrin returned in the lunar module ascent stage to rendezvous and dock in lunar orbit with Columbia. The three astronauts returned to Earth in Columbia. Once freed of the service module, protected by Columbia’s heatshield, the command module entered the Earth’s atmosphere. It used friction, and then two sets of parachutes, to land safely in the Pacific Ocean. Met in the ocean by the Navy recovery team, the astronauts and Columbia were transferred to the aircraft carrier USS Hornet. Columbia arrived at the Smithsonian in 1971 following a NASA-sponsored tour of American cities. It was first displayed in the Smithsonian’s Arts and Industries Building, then went on permanent display in the National Air and Space Museum when the building was completed in 1976. In December 2016, it was moved to the museum’s Steven F. Udvar-Hazy Center for conservation before a two-year, national tour this year. The command module weighs just over 9,000 pounds. The National Air and Space Museum Collection includes 455 additional items that were found in Columbia when it returned to Earth.